Hello, Levi here! I arrived at my new forever home just under three weeks ago and am so excited to be here. I've acclimated well & it feels like I've always lived here. There are always so many people around to give me the constant attention I crave. 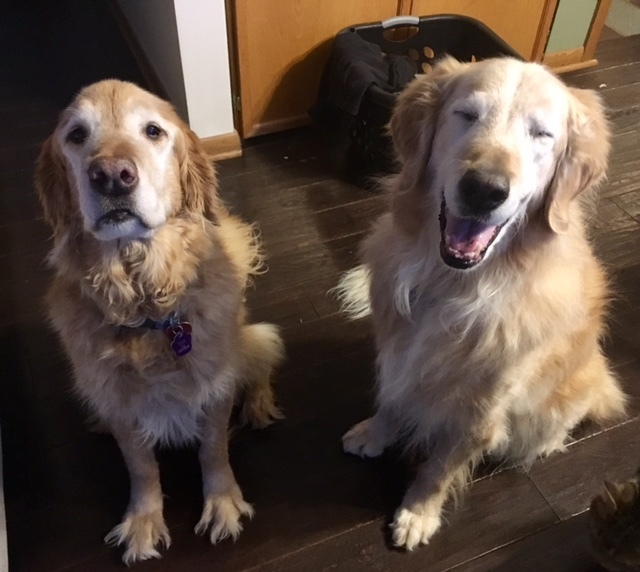 My new golden sister was a bit indifferent at first but she's coming around. There's a sassy black kitten in my new home that likes to taunt me and gives me quite the workout. I continue to chew through tennis balls on a daily basis and like to drag my large bed all around the house. I'm very obedient to both verbal and visual commands. There's a big yard for me to roam. I'm excited for Spring so we can take longer walks & play in the mud. I must modestly say I walk beautifully on a leash. In the photo, I'm the handsome guy on the right and my beautiful new sister is on the left.